August 30, 2014 DETROIT — Former President Jimmy Carter said today that Muslim Americans should use their religious principals to support peace and justice efforts for all. 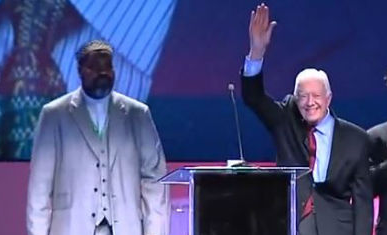 Carter delivered the keynote address at Saturday’s Islamic Society of North America convention at Cobo Center, where he also spoke about his foundation’s work in the Middle East. The Detroit area has one of the nation’s largest Muslim populations. Carter said his foundation is working toward peace in the Middle East, saying a goal has always been for Israel to withdraw from all occupied territories, The Detroit News reported. A subsequent report by the same newspaper provides further details of President Carter’s appearance at the convention. The GMBDW reported last week on what described as the troubling ties of ISNA’s newly elected President Azhar Azeez who is a a founding member and past President of the Council on American Islamic Relations (CAIR) –Dallas/ Fort Worth Chapter as well as a mender of the Grassroots Leadership Advisory Council of the Freedom and Justice Foundation (FJF), a now seemingly defunct organization whose other members were known to be associated with the Islamic Association of North Texas (IANT) which operates the Dallas Central Mosque (DCM). Both the IANT and the DCM are known to be associated with the US Muslim Brotherhood and the Hamas infrastructure in the US including the now defunct Holy Land Foundations (HLF). …the Global Muslim Brotherhood Daily Watch has known for sometime that important elements of the US government were of the opinion that ISNA was an organization that had substantially changed in character over the years. In 2009, we met privately with an FBI official who told us that they were of the opinion that ISNA was under new leadership and that this reflected a meaningful change in the organization. Since that time, the GMBDW and its predecessor publication has reported on numerous occasions where the US government has acted in such a manner that suggests concurrence with this view of ISNA as a rehabilitated organization. ….despite these notable developments, there are good reasons why the Global Muslim Brotherhood Daily Watch remains deeply skeptical about any true change in the nature of ISNA. To begin with, many important US Muslim Brotherhood leaders remain active in the organization. As we said in our post of last week, until such a time that ISNA is led by individuals with an untainted background, we see no reason to move from the skeptical position.